Surviving in a post-apocalyptic world where a lethal pandemic almost wiped out the human race doesn’t sound like a picnic. Caring for a ragtag group of survivors in this setting is even less of a cakewalk, and Happy Hobgoblin’s new title, Nyheim, mirrors this scenario very well. 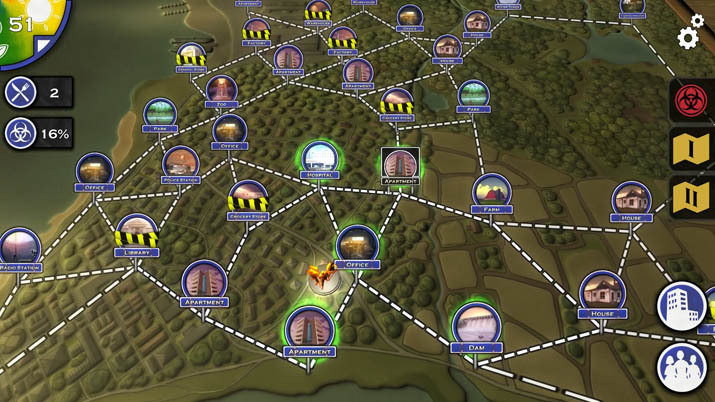 Nyheim requires resource management and planning – or just an ungodly amount of luck. When booting up Nyheim, there’s a short clip that depicts a noticeboard with various news articles and quarantine signs, giving you some background on the deadly pandemic. This little intro sets a dark, gloomy feel that sticks with you as you play. However, this is the only story you’ll get. The focus is more on the gameplay. In order to scavenge or complete an objective, you have to roll certain attributes from your party’s dice. If you don’t like what you roll, you can spend food on a re-roll. Food is vital to survival, and some dice rolls can even take away food, so you’ll spend a great deal of early game time searching for something to eat. If you run out of food, a party member of your choice gets the starvation injury. There are other injuries from various enemies or events that will affect your party, and if one character gets two injuries at once, they die. No refunds. The lack of food, constant injuries, and the ever looming threat of disasters always had me on edge. In the early game, I found myself running around the map trying to stop each disaster. Sometimes a chain of two or three disasters would spawn, and I couldn’t stop them because I had run out of food for my survivors. At first, I thought completing each mission, or even surviving, would be impossible. I’d be halfway to the farm that I had to set up, only to have to turn around to make sure my food supply didn’t spoil back at the headquarters. But that’s what Nyheim is all about. You can’t win them all, and the numerous setbacks and enemies can create a sense of urgency and unease. I found myself thinking, “Should I care for my party’s injuries, or risk searching for food? Should I try to look for that radio, or stick around and wait for this disaster to spawn?” It took a few tries for me to make it into the Winter season, where scavenging for food is almost impossible. By then, I had created a solid scavenging party, with an ample amount of food. Each of my party members had a skill that allowed me to manipulate the dice roll to my liking. From then on, each mission I completed and each crisis I stopped gave me a little bit of satisfaction. 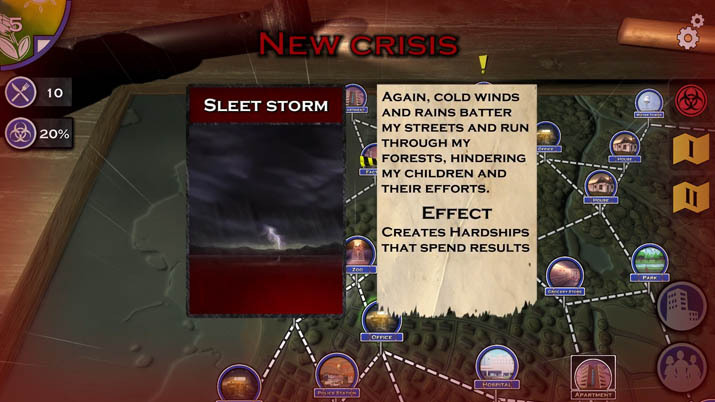 Since Nyheim is essentially a dice-roller, the gameplay can sometimes be repetitive. Once you have a decent party and a renewable food supply, you’ll just be going place to place, finding items that you don’t really need. While the disaster system can create a sense of urgency, it can also become tiresome. Having to constantly turn around to prevent a disaster from occurring becomes dull once the feeling of urgency disappears. However, once you complete a game or two, you can spend XP to unlock certain bonuses that can spice up your gameplay. If a dice rolling resource manager is what you’re looking for, you can ignore what I said about the repetition. At first glance, Nyheim’s cartoonish art style looks pleasant and cute. It’s not until you encounter an enemy or get injured that the art style reminds you of what type of game you’re playing. The grotesque rat enemies and grim background music fit right into the theme of scarcity and uncertainty. It’s not meant to be a lighthearted experience, by any means. But that doesn’t mean there aren’t uplifting moments, where the background music isn’t distressing and things are going your way. Those kinds of moments gave me hope that my next search wouldn’t attract a swarm of rats. Unfortunately, those types of moments got cut short by the dreadful sound of a disaster popping up. The mechanics and gameplay all work as they are intended to, as far as I can tell. There were some points where, after I scavenged an area, I couldn’t pull my characters up to compare their skills with what I found, but that seems to have been an isolated issue. Oh, one more thing about the disaster chains. I noticed that when the disaster probability indicator reached around 20-30%, it fires one or more disasters back-to-back. While this is not unusual, probability-wise, I found it strange that the percentage never rose about 40%. That might just be me and my terrible luck. 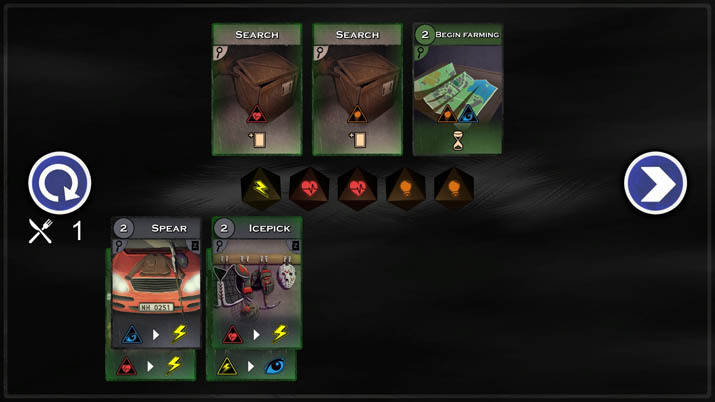 Nyheim is a strikingly illustrated dice-rolling game which emphasizes the challenging survival element inherent in any post-apocalyptic title. While the difficulty seems challenging at first, once you have established certain strategies, Nyheim risks feeling repetitive.